The design and color options of the Puma Phenom piqued the interest of many fashion-forward individuals. The majority appreciated how comfortable it felt during everyday use, running, and training. Many owners claimed that the fit was perfect. Several fitness aficionados stated that their midfoot and ankle appeared to be supported during workouts. The price was considered reasonable by some reviewers because of the value it offered. Several people complained that the opening was tight, which made the Puma Phenom hard to put on or remove. The arch and the ankle areas did not feel supported during training, according to some gym-goers. A few users wished that the laces and the strap tightened the midfoot section; the components were more for aesthetics than function. The Puma Phenom impressed a lot of consumers with its style and color options. Users were satisfied with the comfort and support it delivered. However, there were complaints about its opening as it did not have enough stretch. Others did not appreciate that the laces and the strap did not offer much when it came to fit adjustment. Overall, its positive attributes outweigh the negative, which made it the footgear of choice for many individuals. The Puma Phenom is designed to keep up with high-intensity workouts. Its high-cut profile keeps the ankle supported while the mesh accent on the collar prevents the inside from heating up. Though the trainer features a lacing system, it functions more as a decoration than for fit adjustment. On the other hand, the strap is meant to adjust the fit in the midfoot and enhance lateral support. It utilizes an injection-molded EVA (IMEVA) midsole. This material delivers a lightweight and comfortable ride. Enhancing the cushioning is the IGNITE drop-in insole which is designed to provide stability. Protecting the bottom of the midsole is a full-length rubber outsole which is durable. It utilizes a herringbone pattern for traction. The cut-outs at the forefoot assist in multi-directional movement. 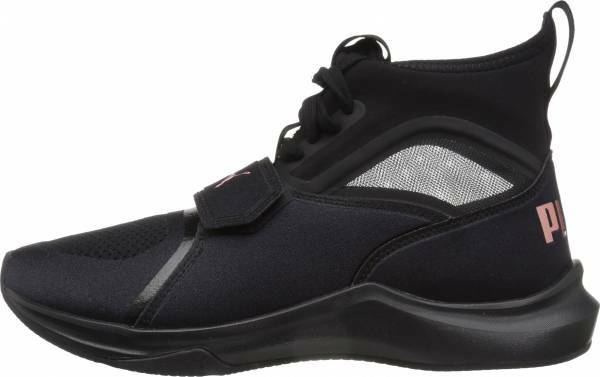 This workout shoe from Puma is designed to meet the unique needs of women. It runs true to size and comes in a B - Medium width profile. The neoprene collar is form-fitting and should be considered when purchasing a pair. Lining the underside of the Puma Phenom is a full-length rubber. This compound is designed to be durable, flexible and slip-resistant. The cut-outs on the forefoot section create zones that facilitate freedom of movement. It also has a vertical flex groove that runs in the center to deliver side-to-side flexibility. For traction, it utilizes a herringbone tread pattern that allows for full-ground contact. The Puma Phenom employs the IMEVA foam. This platform is designed to be lightweight, durable, and flexible. It extends upwards in the lateral and medial sides of the midfoot and the heel area. THis build offers support during explosive routines. Lining the inside bottom of the footwear is the IGNITE drop-in insole. Aside from providing an extra layer of comfort, it is responsive and maximizes energy return. It is also designed to sustain both hot and cold conditions, so it remains solid to deliver a stable platform. A combination of mesh, neoprene, and synthetic materials make up the upper of the Puma Phenom. Two types of mesh are used in this model to keep it well ventilated: a tight mesh at the forefoot and a sheer one at the collar. The synthetic component is used in most of the upper and gives structure to the trainer. The neoprene is found at the topmost part which provides users with the feeling that they are wearing a sock. It features the lace-up and hook-and-loop mechanisms at the midfoot section. The lacing system may not offer much in terms of fit adjustment, but the strap allows users to make the middle area feel tighter to enhance lateral support. Puma offers several more models of high-top workout shoes in its Fierce line. One of the highly-rated ones is the Puma Fierce Strap.